Once again I was up early and had a leisurely breakfast. Once again I succumbed to the Omelet so I definitely needed some exercise to work it off. I decided to take a walk and try to find some accommodation options for a future trip. 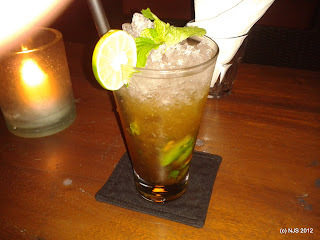 I intend to re-visit the Seminyak area of Bali next year as part of a group. The party girl has already nominated times and places. The accommodation selected is a bit pricey for a single person. It is certainly OK for couples wanting a splurge. So part of my tasks while here was to look nearby for alternates that better suited my budget. I wandered along my chosen path and got tempted by a massage along the way. My Masseuse was quite insistent that I should be having 2 massages, one to be conducted later in the evening in the privacy of my hotel suite. I declined the offer, much to her disappointment. A nice hour long massage is not a bad way to start the day however. A little further along I then got tempted by a Barista and had a nice coffee in one of the cafe's that I passed. I felt very relaxed by this stage. By the time that I got to the area to search for accommodation the day had warmed up and the thought of imminent dehydration was beginning to concern me. However I held off from having a beer and did some door knocking in the area. This part of Seminyak is just off the main road and has several private (and expensive villas). A little bit far from the beach, so it does not attract the beach crowd, but close enough if and when you want to get there. As it was I ended up back very close to Vivai restaurant the scene of yesterdays Cooking class. This was a fortunate coincidence not so much planning or design. By the time that I had inquired at a few places, it was hot and basically lunch time. I popped into Zappaz Bar and Restaurant and had a couple of beers. Having a paying customer in the place seemed to be all a bit difficult for the staff, who were more interested in chatting to their friends, so I moved on. A nearby restaurant in the same complex as Vivai caught my eye and I settled into a chair and a Mojito and a very nice Nasi Campum (they insisted it was Campum not Campur) for lunch. This variant had Beef Rendang as the meat and was very tasty. Washed down with another beer also after the Mojito. After that I wandered back to my hotel and had a late afternoon swim in the hotel pool. The water was very cool and not very pleasurable. That evening I had booked at Vivai for their Spit Roast Suckling Pig dinner (Babi Guling). I was a bit surprised when I was the first person at the restaurant, at 7pm. It will no doubt get busy later I thought, but in fact it never did. I settled at the bar and had a damn good Mojito. So good that I had another, and later on another and after that who cares. The staff began to bring my meal out to where I was settled. That was OK as it was all pretty much nibbles and finger food at this stage. A succession of Satay, Corn fritters (Perkedel) and other nibbly bits. 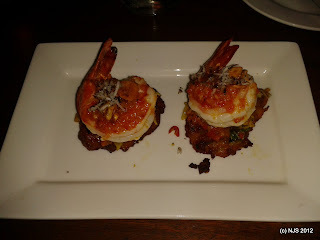 Each was very well presented and very tasty. I felt like I was being treated like royalty. When the main course came out I asked to move to a proper table. 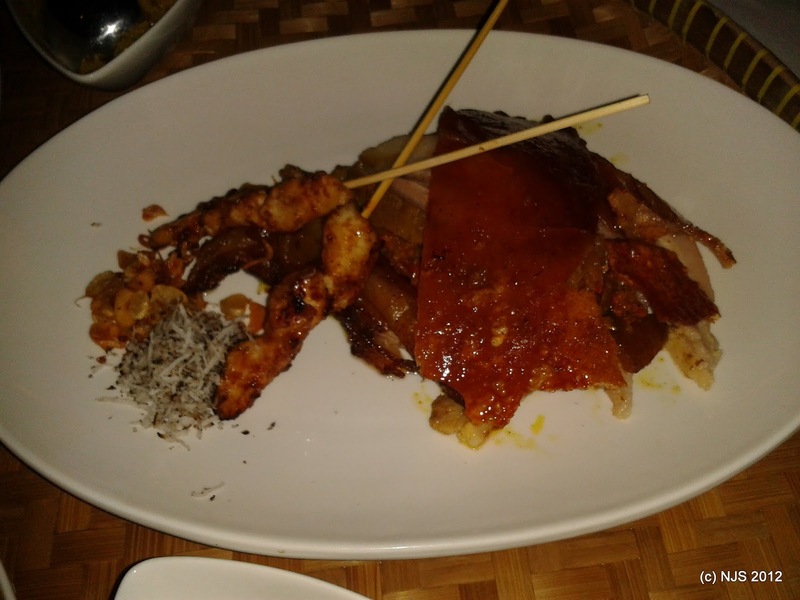 I was presented with a huge plate of pork belly and crispy pork crackling and a plethora of side dishes to go with it. It was obvious to me that as the only person eating pork that night I was not eating off a spit roast. I was not upset by this however as the meal was delicious. Far too much to eat but I struggled on. 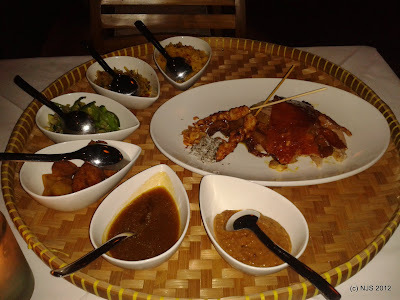 I have found that it is common practice in Bali to have to order suckling pig and in some cases even whole duck, a day in advance. This is due to the length of time to cook it and the expense of the meat. Restaurants simply do not cook these meals and hope somebody comes in and buys them. I was lucky that the chef at Vivai had accommodated my desire for Pork, and he had also done a fabulous job. The Roast Pork with accompaniments. The camera angle does not do it justice. 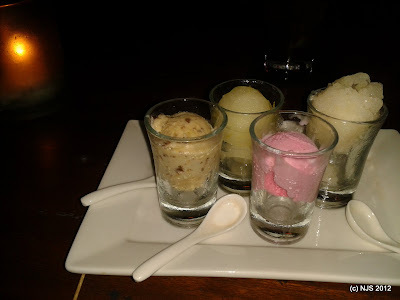 After the "pig out" I returned to the bar area, where I was presented with 4 different ice cream samples for dessert. Rum and Raisin, Lemon and I cannot remember the other flavours. All freshly made on the premises (as far as I know). Dean the chef joined me and we sat talking and drinking for some time. The restaurant was very quiet that night. When I left Vivai, I discovered that the other restaurants and bars were also quiet and my taxi driver who took me back to my hotel lamented how little work he had that night. In fact during the drive back the Taxi driver convinced me to book him for the next day and have a tour of various parts of the island. I had been considering that so it was an easy decision. We arranged that he would pick me up at 9am the next day. The Bludger was overly full but very happy.